Gavin Henrick is a solutions consultant based in Dublin, Ireland who works with assisting organisations to implement a range of open source learning technologies including Moodle and Mahara. He facilitates project consultancy and training workshops on e-learning project rollouts and upgrade strategies. Gavin has worked with technology in business, learning and development for over 10 years. He has been working with Moodle, Mahara, DSpace and other open-source applications for the last 4 years. Gavin currently focuses on supporting organisations with e-learning projects including Moodle 2 rollouts and upgrade strategies through project consultancy and training workshops. 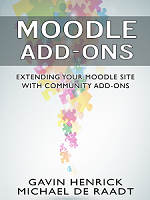 Gavin recently co-authored the book for Moodle 2.0 for Business Beginner’s Guide with Jason Cole and Jeanne Cole. This was published by Packt Publishing in May 2011. Gavin blogs at (http://www.somerandomthoughts.com) where he regularly provides information on Moodle including reviews of community created plugins and themes. He is a regular speaker at a number of Moodlemoots and conferences on the use of Moodle focusing on practical examples of usage.